Everyone has probably come across a money management tactics Martingale in any of its form. Whether for increasing trades, multiplyng sums at a roulette or blackjack or any other way. 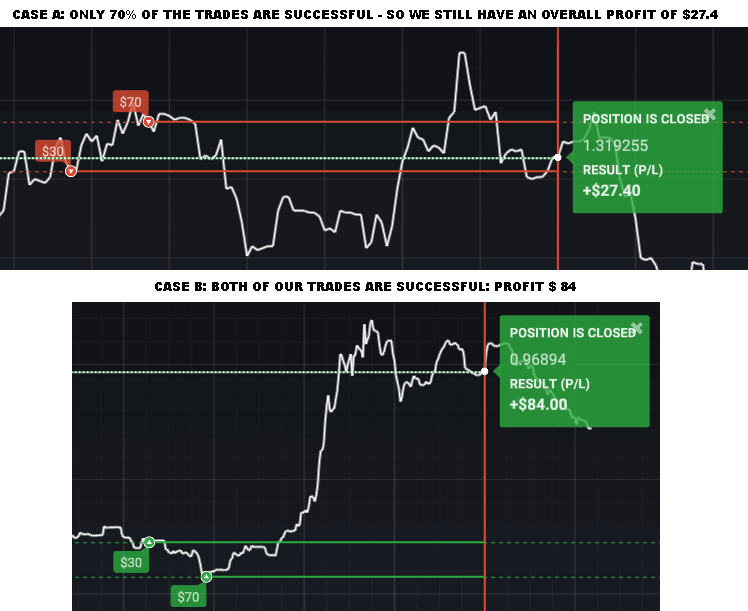 And everyone probably knows that even though this strategy can help reduce unprofitable trades thus move us into a total profit, it does not always happen. Sometimes martingale clears your account completely and certainly nobody wants that. Therefore, a few clever heads got together and created a money management tactics called trade splitting. First, we enter the trade CALL with $30 And then, if the price moves down, we will execute the trade again, but with $70. In the picture below, you can find a demonstration of trade splitting with a broker IQ Option. What might happen in a case of trade splitting? In fact, there are only 4 possible outcomes. 3 of them bring us profit, only one does not. Trade splitting is a good money management strategy. Unlike martingale, it does not work with the sums from the trades consecutively, but it works directly with individual trades and try to make them profitable. However, I do not recommend using Trade splitting in cases you are 100% sure that the trade will work out. (E.g. the price bounced off a strong resistance line) In this case, you’d only be robbing yourself of profit.